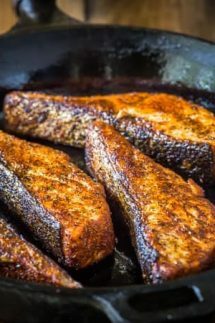 Blackened Salmon with Homemade Blackened Seasoning, an easy low carb, Paleo & Whole30 salmon recipe that you’ll love! 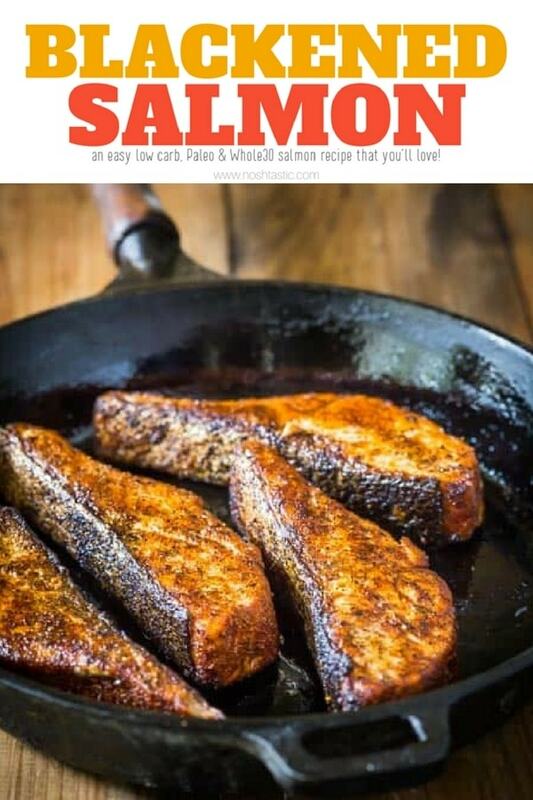 Here are a few simple tips for cooking blackened salmon, it’s really very easy! First, you need to measure out 5tbsp of my Homemade Blackened Seasoning and rub it well into the salmon pieces. 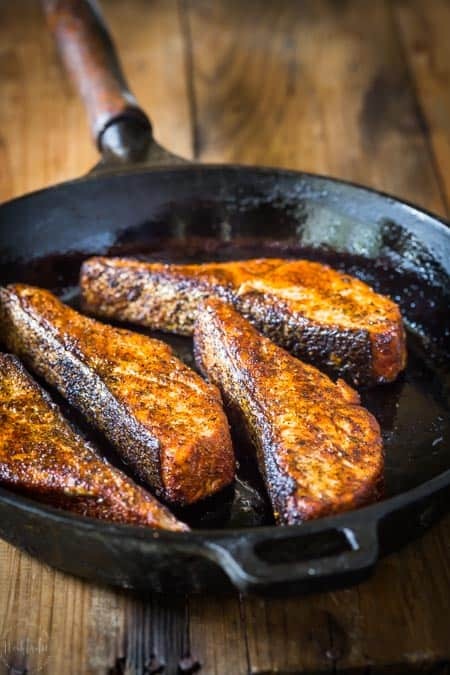 I prefer to use a large well seasoned cast iron skillet to cook my blackened salmon in as I find that’s the easiest method . You may not care about the skin on the salmon, but I love it when it the skin is crispy, so make sure you are using a medium heat, and not have it too hot or it will burn. I cook my blackened salmon for about 8 – 20 minutes depending on the thickness of the fillet. You will just need to check and see when it is cooked to your liking. How Long do I bake Blackened Salmon? First, line a sheet pan with parchment paper so the salmon fillets do not stick to it. Then, rub the salmon with the Blackening Spices as before. The salmon cook time with depend on the thickness, if it’s about an inch thick at the fattest part of the fillet it will take about 6-10 minutes to cook depending on actual thickness and your oven temperature. I would check it after 8 minutes for doneness. The hardest part of grilling a piece of salmon is making sure it does not stick to the grill, so for that not to happen you need to make sure the grates are clean and well oiled. As I’m not a grill expert I much prefer to use a flat grill topper pan like you see below , that way if the salmon flakes and falls apart I don’t lose it all through the grill grates, and it’s less likely to stick to that sort of pan. 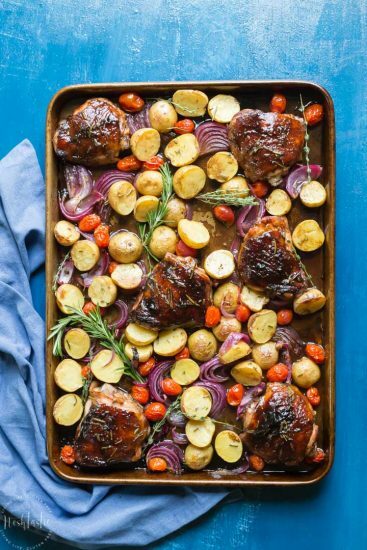 You need to try my delicious, easy, sheet pan Paleo Balsamic Chicken recipe with Roasted Potatoes, Red Onion, Tomatoes & fresh herbs! You can cook it on one pan in the oven in an hour or less! 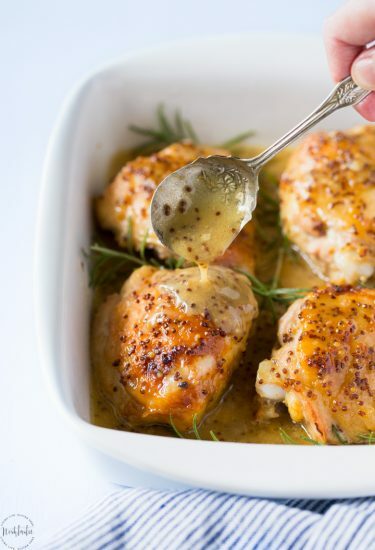 My Paleo Honey Mustard Chicken is so simple to prepare and cooks in the oven in about 45 minutes, It’s a very easy weeknight dinner that your whole family will love! 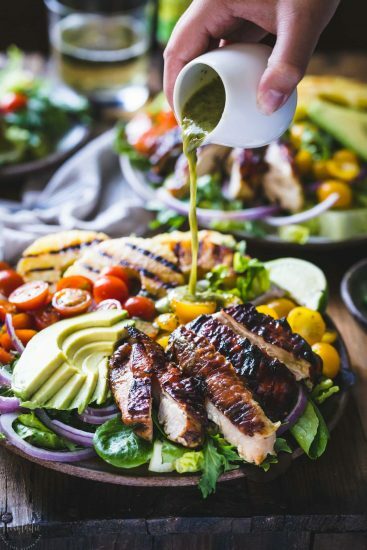 You’ll love my Cilantro Lime Chicken Salad with Grilled Pineapple, it’s so easy to make! 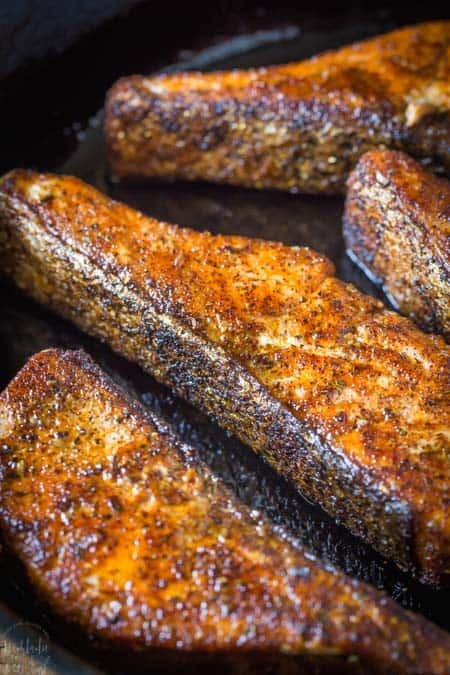 Blackened Salmon with Homemade Blackened Seasoning, an easy low carb, Paleo & Whole30 salmon recipe that you'll love! Generously rub the homemade blackened seasoning over the salmon fillets. If your salmon fillets are large you may need more spice rub. Heat your cast iron skillet to a medium heat and add about 2 tbsp olive oil to the pan. When it's hot, add the salmon skin side down. It will take about 8-20 minutes to cook the salmon, exact cook time depends on the thickness of the fillet. You can turn the fillets over if you need to and cook on one other side once the skin has crisped up. Do not have the pan too hot or you will burn it on the bottom before the fish is cooked.